If this picture seems a bit familiar to you, it’s probably because you might have seen similar photos here on Weekly Fifty around this time of year. However, just like last week’s image this is more about process than product, and what it represents to me is more important than the picture itself. One of the best things about using a camera is that it forces you to see the world around you in a bit of a different light. If I have my camera on me, preferably in my hand or around my neck (yay Black Rapid!) I’m constantly looking at things a bit closer, or from a different perspective, or just stopping to take in the world around me when I would otherwise just be walking on by. Case in point: the image you see here. One of the best parts of spring is the tangible ways in which you can see the world reawakening and coming to life after winter, even a relatively mild one like we have had this year in Oklahoma. Dry tree branches, brown patches of grass, and dirt-laden flowerbeds slowly turn to color as the world shifts from grey to green, and looking at all this through the lens of a camera really can be quite fascinating. 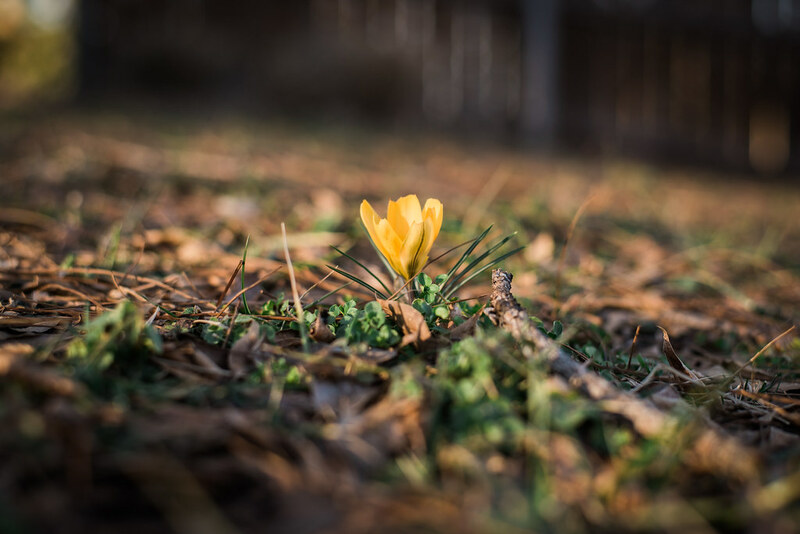 Almost every year one of the first signs that spring is on its way is the appearance of crocuses in our yard, and I happened to see this one when I was outside playing with my kids on an afternoon in mid February. I don’t even remember what the three of us were doing but I think my wife was working on revising an article to submit for publication so I took the boys out to…who knows. Does it even matter? We were outdoors probably playing hide and seek, digging up the front yard, maybe climbing trees, or some other such activity that is not all that conducive to the chilly months of winter. My oldest son saw this flower and asked if he could pick it, and I said yes but asked him to hold off just a few seconds while I snapped a picture. You can’t tell from the image but he is literally standing just a few feet away right out of the frame waiting for daddy to finish messing around with the camera, after which he and my other son came right over and investigated this little yellow slice of nature a bit more closely. Back then I usually approached a photo with the mindset of “BOKEH BOKEH BOKEH!! !” and the result was (and sometimes still is, if I catch myself off guard) a bit clumsy and distracting. While I do like the sense of context in the original photo with additional flowers receding into the background, the thin depth of field makes for an unpleasant composition overall. The colors are also over saturated with highlights that are far too bright, but photography is nothing if not an iterative process and this week’s image is a bit of evidence to prove it. There is always something new to learn, and if you ever feel as though you’ve reached the point at which you don’t think you can grow any more as a photographer it might be best to find yourself a new hobby. I appreciate your perspective of including a bit of foreground and background in the picture. Until today , reading your blog, I’ve been carried away with creating bokeh . I know what you mean John! One of the nice things about prime lenses is their much larger apertures which can sometimes be a bad thing if your background blur gets out of control. I have way too many shots in my collection where I clearly prioritized a blurry background over a pleasing composition. That second picture to me has much more depth (foreground,background). Enjoyed it immensely. I too have been really pleased with all the color coming out during springtime. That has been the subject of just about all my photos lately! Well done. Thanks for your comments, Lisa! I always think it’s interesting what different people prefer when it comes to art whether it’s photography, literature, paintings, movies, music, etc. I’m glad you like the second picture even though I tend to prefer the top one, and now you’ve got me curious about your own pictures. 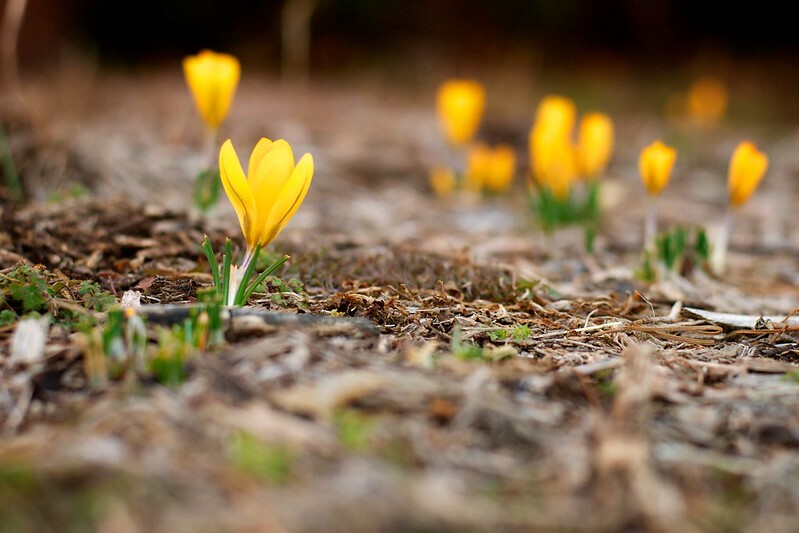 Do you share any of your springtime pics online? It’s always fun to see what other people are photographing. Comparing your more recent image to your 2013 image: I appreciate the subtle use of color and how it combines with the use of light, focus and blur to hold your attention to pause on the little details of the flower. What I am learning more and more from these posts is that we should explore the entire range of aperture that we have available and combine it with a proper composition to create a pleasing result. Thank you for putting the time and effort to keep this site going. David, I think that pun made me grin a bit more than I care to admit :) I’m always glad to have your comments here, and I like how you kind of summed things up when you said we should use bokeh as one part of a pleasing overall composition. I like that sentiment, and I think you said in one or two sentences what I probably stretched out over an entire post! “Beauty is in the eye of the beholder” – I must say I love the second, earlier photo better. I love the composition and the use of the rule of thirds. Winter is not my most favorite season, so I enjoy seeing these first glimpses of spring. But like you said, this hobby is a continually learning process. We need to try different things all the time to see what we like best. Thanks for sharing!